Papier mache skull for Noah’s shrine. I made my first shrine for Noah on a Sunday afternoon ten months after his death. At Mass that All Saints Day morning, I was shaken from my reverie when our priest read the names of parishioners who’d died that year. “Noah William Miesch,” he said. Noah was included on a list of people I only vaguely knew, older people mostly shut-ins and the very ill whose names I’d seen week after week in the parish bulletin. That day we were urged to remember our dead loved ones, so I came home from church and built a shrine on the kitchen cupboard with a box of pasta, a photograph of Noah and a SpongeBob toy. Over the last eight years, I’ve created increasingly elaborate shrines for Noah and incorporated some traditional Dias de los Muertos objects—mostly skulls and skeletons—which Noah liked. 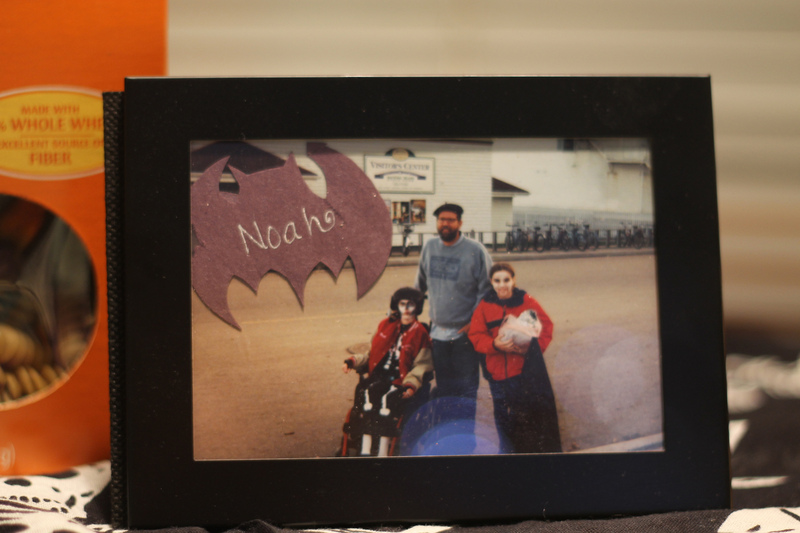 Oddly, the last Halloween Noah was alive we were at Mackinac Island and he dressed as a skeleton for the festivities there. I place that ironic photograph on the shrine each year. 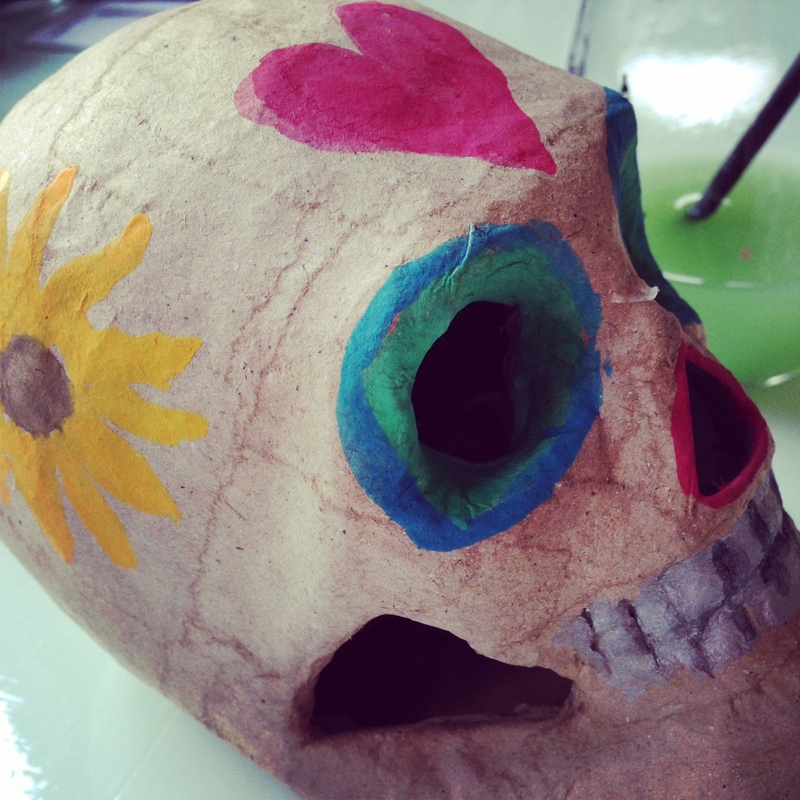 Day of the Dead celebrates the lives of people who have died, not that they are dead. This is the message I tell people who are interested in my book, too. I’m careful to not commandeer this holiday, being sensitive that my ethnic heritage is mostly Swedish, not Mexican. I think respectful cultural appropriation is okay—it’s part of being a citizen of the world and forming relationships with people who are different than me. Adopting cultural traditions is part of being inclusive and being included. I’m happy to share that I’ve created a shrine for Noah that will be on view at Grand Rapids Public Library starting October 29. There are a lot of shrines at the library each year and I hope you’ll take the time to stop by to see them. On Saturday, November 1 at 1:30 PM, I’ll talk about my altar along with with other altar-makers and I’ll be reading a bit from my memoir He Plays a Harp, too. Come celebrate. Photo of Noah as a skeleton. He’s with Mike and Tasha.